A bank reconciliation is the process to eliminate (or explain) differences between a bank’s records of your deposits and withdrawals, and your own personal record. 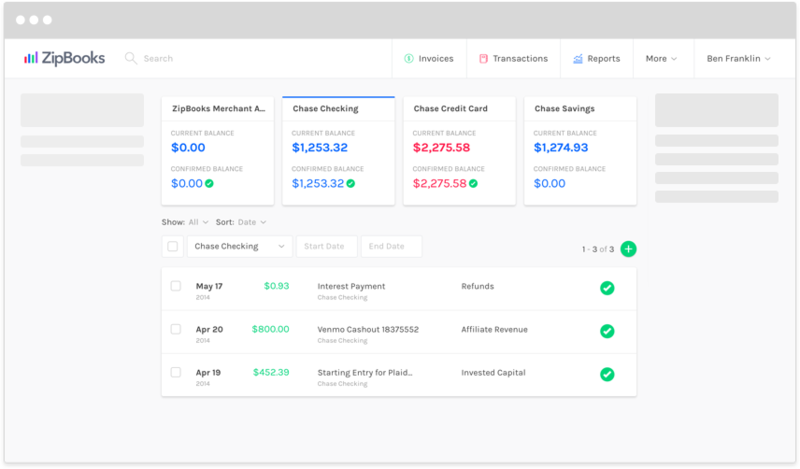 ZipBooks provides an easy way to reconcile all your bank accounts, without needing to keep a paper check register on hand. Once you've connected your bank and credit accounts, ZipBooks will automatically transfer the data into your ZipBooks account. We'll display the current balance of your bank account along with the transactions you've confirmed in ZipBooks to make reconciling simpler. Invoices, bills you pay, and other income and expenses that are created within ZipBooks will automatically transfer to your accounting records. As a bonus, you can easily input any transactions made outside of ZipBooks to keep your records perfect. As you categorize and review transactions, place a checkmark next to each transaction on ZipBooks that’s recorded on your bank statement. As you go, we'll let you know the number of transactions that aren’t yet verified, and the total amount of those transactions, ensuring that you keep track of everything, down to the penny. We'll even give you a heads-up on how long it may take! If, for any reason, you can't connect your bank, simply transfer transactions into ZipBooks from a bank statement or other accounting program using our convenient import tool.